Provincial Fossil Selection-kids and parents vote before Nov 23! The Ministry of Forests, Lands, Natural Resource Operations and Rural Development is seeking input from the public on designating a Provincial Fossil to be added to the official Provincial Symbols of British Columbia. Canadoceras, common name ‘Canadian Horn Ammonite,’ is a classic example of an ammonite which is an extinct fossil group that occupied the seas and oceans for a time span greater than the dinosaurs roamed the Earth. The ammonite had a soft part similar to an octopus or squid that occupied a hard, spiral external shell. These ammonites lived during the Cretaceous Period of the Mesozoic Era, approximately 80-84 million years ago. These fossils are commonly found on the eastern side of Vancouver Island. 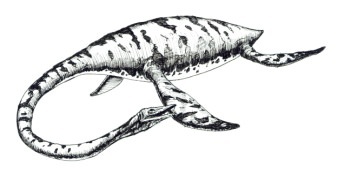 Elasmosaur was a large and predatory marine reptile with a long neck and flippers used for swimming. This marine reptile roamed the seas covering British Columbia roughly 80-85 million years ago, during the Cretaceous Period of the Mesozoic Era. Fossils of the Elasmosaur have been found near Courtenay on Vancouver Island. 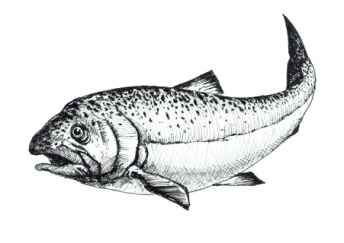 Eosalmo is a genus of extinct salmon which lived during the Eocene Epoch, about 50-53 million years ago. 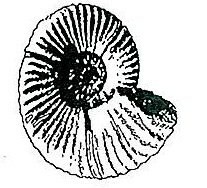 The genus was first described in 1977 from fossils found in lake deposits at Driftwood Canyon Provincial Park near Smithers, British Columbia. Eosalmo fossils have also been found at sites in Princeton, BC and in Washington State. Ichthyosaur, a marine reptile, had a large whale-like body, a long dolphin-like snout, and flippers that were used for propulsion and balance while swimming. 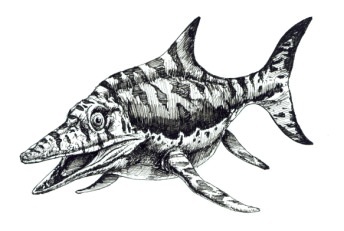 Some ichthyosaurs were the largest marine reptiles to have lived in the world’s seas, and include some of the largest fossils that have ever been found. This fossil was found near the Sikanni Chief river in the northern interior of British Columbia. 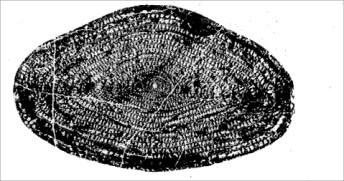 Ichthyosaur fossils are also known from Triassic and Jurassic rocks of Vancouver Island and Haida Gwaii. Marrella, common name ‘Lace Crab’, was a jointed-legged animal similar to crabs, spiders and other insects found today. 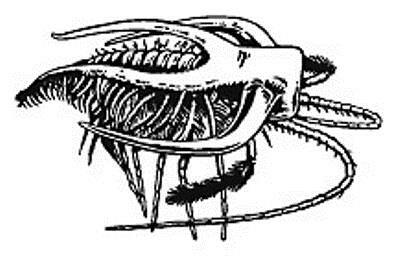 The Lace Crab lived approximately 508 million years ago during the Cambrian Period of the early Paleozoic Era. Lace Crabs are one of the most common fossil types found at the Burgess Shale World Heritage Site in Yoho National Park. Olenoides was a trilobite, a group of extinct marine arthropods, and lived during the Cambrian Period, about 508 million years ago. Its fossils were first discovered in the Burgess Shale beds in Yoho National Park in 1909, where they are abundant. Olenoides trilobites were part of the great Cambrian Explosion of life forms that took place in the early part of the Paleozoic Era. Yabeina was a single-celled animal that lived in the oceans covering much of British Columbia approximately 260-268 million years ago, during the Permian Period of the Paleozoic Era. Occurrences of Yabeina in North America are rare and unusual, and their presence in the Marble Canyon of British Columbia is evidence that these rocks formed originally in far distant regions.